DESCRIPTION: Guide Price: £250,000 - £265,000. A pleasant and surprisingly spacious one bedroom end terraced period cottage in this popular location on the outskirts of Rusthall village. Boasting a number of period features and enjoying areas of exposed woodwork, brickwork and original brick floors to the kitchen, the property has a generous principal lounge with good space for entertaining alongside a further long and wide galley style kitchen with a breakfast area at the end. 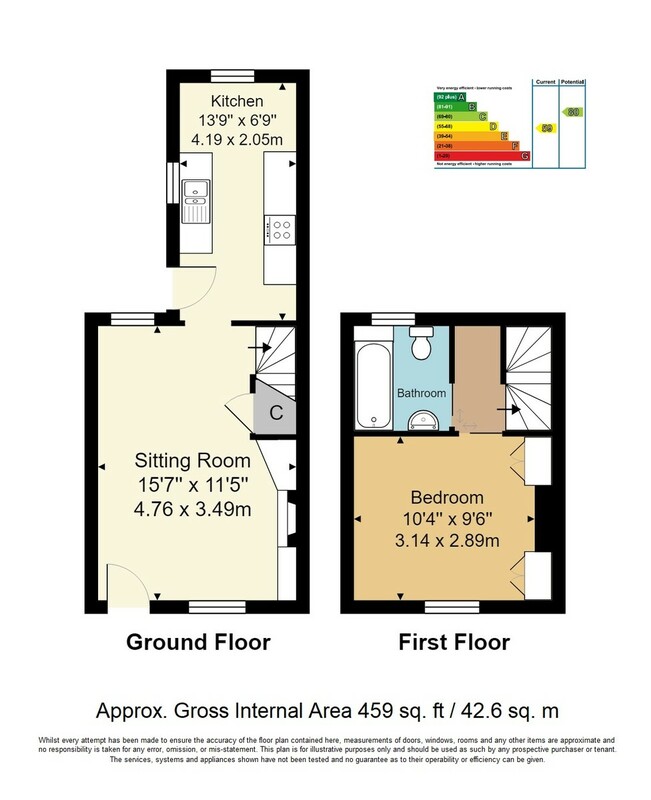 On the first floor there is a good sized double bedroom and further attractive and recently fitted bath/shower room. Externally the property has a small driveway to the front set to brickwork with a long rear garden - primarily low maintenance - with a detached shed and right of way for the neighbouring property. KITCHEN: Fitted with a range of wall and base units and a complementary work surface, slimline dishwasher, integrated one and a half bowl sink with mixer tap over, freestanding washing machine. Inset four ring electric hob with extractor hood over, integrated electric oven/microwave and freestanding fridge/freezer. Painted brick floors. Partially glazed stable door to side, further casement window to the side with fitted blind and additional casement window to the rear. Space for table and chairs. Wall mounted electric heater. Good areas of exposed woodwork to the ceiling. Part tiled walls. BEDROOM: Casement windows to the front with fitted secondary glazing and fitted Roman blind. Two fitted wardrobes one to each side of the exposed brick chimney breast, further drawer unit into the chimney breast. Carpeted, radiator. BATHROOM: Fitted with a suite comprising pedestal wash hand basin, panelled bath with fitted glass screen, mixer tap over and further single head shower attachment, low level wc. Laminate flooring, part tiled walls. Areas of exposed beams to the ceiling. Wooden casement windows to the rear with inset opaque panels. Wall mounted radiator. REAR GARDEN: Low maintenance paving to the side of the area with an external tap and further area of low maintenance decking to the immediate rear of the property with a good size for table, chairs and entertaining. Retaining wooden fencing, a further area of stone chippings and paving stones towards to the rear of the property and a small external storage outhouse. There is also a gate leading to the neighbouring property which affords the neighbour a traditional right of way along the rear and side of the property. AGENTS NOTE: The Range is a cosmetic feature and not a working oven.